Techno Goober employs a brother-sister team. One tech and one amazing (and very humble) writer. Recently, a client approached Tech Steve (my brother) and asked about installing a Google Home. The client wanted to know: Is Google Home worth it? The product boasts voice-controlled services like music control, TV control, shopping lists, phone calls, texting, and smart home features like turning lights on and off. We all know that products may boast amazing services, but are the services really all that special? Techno Goober is committed to going above and beyond to answer our clients’ questions. That’s why we thought it was completely necessary to go out and purchase not one, but TWO Google Home devices for our home. At least, that’s what we told ourselves. We set the first Google Home up in our kitchen and put the Google Home Mini in the living room. We figured these were the two rooms with the highest traffic in our home and could benefit from a Smart Assistant most frequently. The Google Home and the Mini need to be plugged in to work. We selected locations nearby outlets, but still central to the room. (We also needed to be careful to keep the Google Home away from damaging heat or water in the kitchen.) The Google Home ended up next to the Coffee Maker and away from the sink and stove while the Mini made its home beside our TV. Setting the two devices up was a relatively simple process. To test how simple the process was, Tech Steve made me help. As the Dr. Doolittle of technology, he usually handles all these electronic in our house. But, to truly determine if the Google Home had an easy setup, we had to rely on my mediocre tech skills. Setting up the first device was super easy. All we had to do was plug it in and turn it on. The device walked us through setting it up. All we had to do was download the app on our phones, log in with our own existing Google Accounts, and select “Add a Device.” The whole process was pretty painless. We were even able to create a shopping list and share it with our entire household straight from the Google Home app. After finishing setting up the Google Home in the kitchen, it was time to set up the Google Home Mini. This is where I started to doubt my abilities. The website claims that we can link multiple Google Homes “easily” for multi-room control. How easy would this process be? Actually, incredibly easy. After plugging in the second device and turning it on, we simply added the device to our account on the Google Home app. The entire process took less than fifteen minutes. No arguing, no hassle, and no confusion. Ok, I know. We’re two intelligent young people who both work for a Web Development company. Steve’s job is literally to fix technology. He could probably do this in his sleep. How can we expect an older person to use this device without getting stuck? We told our mom that we bought a Google Home. I told her it’s a voice-command Google. He helped her download the app in the App Store. We told her to use the Google Home. She had to set up the App by herself. After connecting her account to the devices, she trained the device to recognize her specific voice. Then she started messing around. My dad was a little mad when he found out that we purchased TWO Google Homes. However, we are finding that the second device is really useful. With two devices, we are able to reach the Google Home from nearly anywhere in the house. We have an average-size house for four people, but the Google Home has a pretty far range. At a normal or slightly above normal voice, the Google Home can hear us from nearly anywhere in our house. To prove this point, shortly after purchasing the Google Homes, I was in my room telling a friend on the phone about our new Google Home experiment. In a normal tone of voice, I told her that we can say “Hey Google, play music,” and it will start playing your last Spotify playlist. The Google Home heard me from my room and started playing my favorite playlist. After laughing for a few minutes, I told Google to stop playing music from my room. It heard me again. We all had a laugh over that, but we also learned that the Google Home is always listening, and it has a sharp ear. We are able to transfer music from one device to the other to follow us through the house. For example, every Sunday is cleaning day in our house. During this time, we’ve taken to playing music on the Google Home. We are able to start a song in the living room then transfer it to the kitchen with an easy voice-command when we switch rooms. There’s no disruption. It barely misses a beat. If we want to play music through both speakers, we simply tell the device to play music on the “Home Group.” The “Home Group” is a custom group of devices we created that includes both our Google Home and the Mini. For homes with two or more devices, you can create a variety of different groups to control specific parts of your home. Tech Steve handled this part of the process. He started by downloading the Harmony Hub app. Next, he plugged the hub into a wall outlet. The app provided prompts to follow to continue setting up the hub. The prompts were similar to those one might expect when setting up a Universal Remote. It was a little more complicated than setting up the Google Home with a few more steps. All in all, the process took around 10 minutes. After the Harmony Hub was set up, it was time to link it to our Google Home. We used the command “Ok Google, ask Harmony to link my account” to start the process. After waiting a few moments as instructed, we opened the Google Home app and followed the prompts to link the devices. You can also use this handy support article from Harmony. Even my three-year-old niece has figured out how to turn the TV on and search for her favorite shows with commands like “Hey Google, ask Harmony to play Mickey Mouse on Netflix.” We can even turn the volume up and down on the TV with voice commands. Randomly at dinner one night, I asked Google to tell us a joke. The joke it told was kind of bad. I asked for a better one, but its operating system didn’t recognize the command. Off-handedly, we decided to ask Google to tell us a riddle instead. We were completely unprepared for the adventure that this would embark on. It started out relatively normal. Google told us a simple riddle that we guessed in seconds. We expected the game to be over after that. After telling the riddle, Google proceeded to narrate an exciting journey through various scenes with numerous sound effects. Each scene had a riddle to solve before Google would ask if you want to keep going. We, obviously, said yes. Our experience with the riddle adventure led us to start asking Google other questions to prompt an exciting answer. Telling Google to tell you a story or read you a bedtime story will result in a 2-5 minute bedtime story narrated by Google. Every story comes filled with sound effects and fun voices. No dreary robot reading. The stories are taken from free Google Play children’s books. Meaning, the book is real. You just don’t get to see the pictures. Google Home offers a variety of other child-centric commands. Try asking Google to sing you a lullaby, sing a nursery rhyme, tell you a poem or even sing you Happy Birthday. If you’re feeling brave, ask Google to tell you a scary story or play truth or dare with friends. Asking Google to play a game will give a range of options. There are over 40 different games you can play with Google. Read a description of Google Lucky Trivia below. You can choose to play Lucky Trivia alone or Lucky Family Trivia (with as many players as you want). We played family trivia with our parents. We were assigned player names in order for Google to voice-match the correct player with their answer. Our first time playing, our names were Lumberjack, King Crab, Mushroom, and Board Shorts. The game was relatively short with only three questions per player totaling 12 questions. Google kept track of the score and announced the winner at the end. See other Google Home Games. All in all, our family loves the Google home. We listen to music more while we are cleaning or cooking. I have also noticed that we spend more quality time in the living room playing games or listening to stories without spending an hour looking for the remote the cat hid under the couch. No one has forgotten anything when we go to the store either with the built-in shopping list function. Our Favorite Functions are the Spotify integration, Harmony TV, and other custom commands like “Hey Google, good morning.” This command starts a chain of actions for Google including reading the weather report and recent news. With smart wall outlets, the Google Home could start the coffee pot or turn the lights on too. We look forward to setting up smart home functions like connecting our new Nest thermostat and installing smart wall outlets. So, did we convince you? Do you want a Google Home Smart Assistant now? Techno Goober can help with purchasing and installing your Google Home. Ask us about Harmony integration and other integrations to make your life easier. 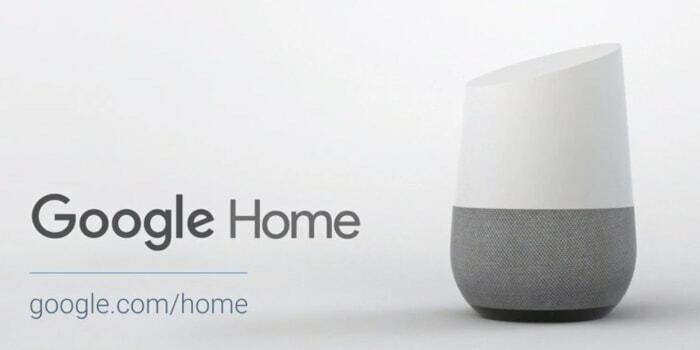 Call 302-645-7177 for a free quote on Google Home installation and training. Just ask for Tech Steve, our Google Home expert. 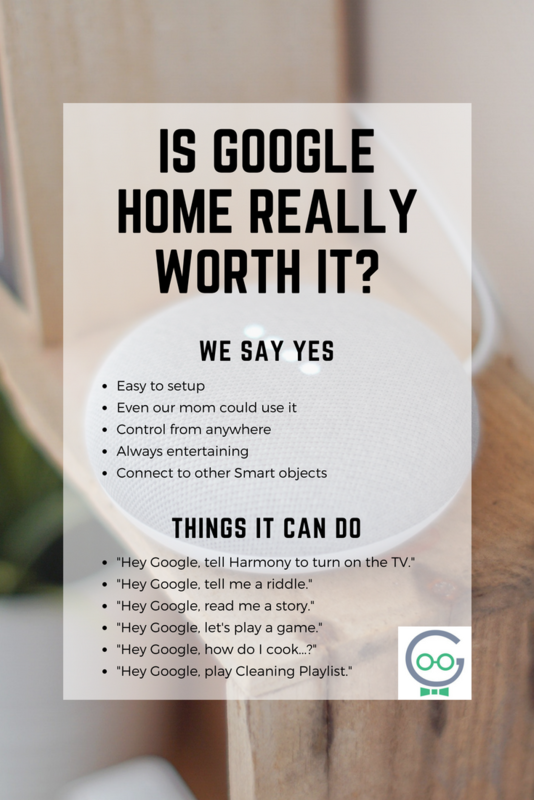 Contact us for help with your new Google Home. We can also help with computer repair, Wi-Fi troubleshooting, and installing security cameras in your home or office. Learn more about our Tech Services. Concerned about your aging friend or family member? Sign them up for Techno Goober’s Senior Tech Support Services. Discounted tech help designed just for seniors. Learn more.